As the leader of customer-focused terminal operations in North America, GCT USA welcomed on Jul29 the Hyundai Saturn to GCT Bayonne. 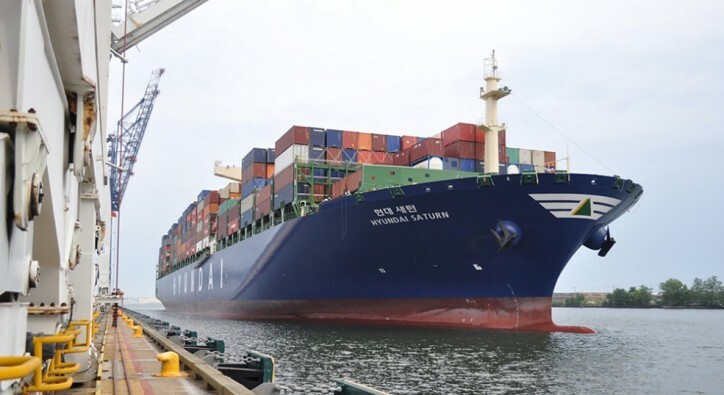 The Saturn is the first of five Hyundai ships in the G6’s New York Express (NYX) service calling the port of New York and New Jersey through the expanded Panama Canal. The Saturn and its sisters are the first Hyundai neo-Panamax class vessels deployed on the Transpacific-US East Coast trade lane, all boasting a cellular capacity of 10,077 TEUs. Serving New York as the first North American port-of-call, the enhanced NYX service connects the largest East Coast market to the carrier’s wider network in Latin America and Central/Northeast Asia. Calling state-of-the-art GCT Bayonne, the Saturn is handled at the port’s marquee big ship ready facility, which already services the largest vessels transiting the new Panama locks and the Suez Canal. South Korea-based Hyundai Merchant Marine is a leading container carrier deploying increased tonnages on more fuel-efficient vessels with significantly lower emissions via the Panama Canal. GCT USA completed its expansion of GCT Bayonne in 2014, deploying the lowest emission, most efficient equipment fleet serving the largest ships on the trade lane.